Question: Can next invoice global code start from 0001 at the 1st of January each year? Answer: Yes, to reset your global invoice code at the beginning of every year, please run a Projetex Workstation under an Administrator account and go to "Administrator >> Codes" in the Backstage View. Thereafter please check the "Enable annual numbering resets" option. Important notice: Enabling this option is irreversible. If you ever want to roll it back, you should reinstall the application. Is it correct? 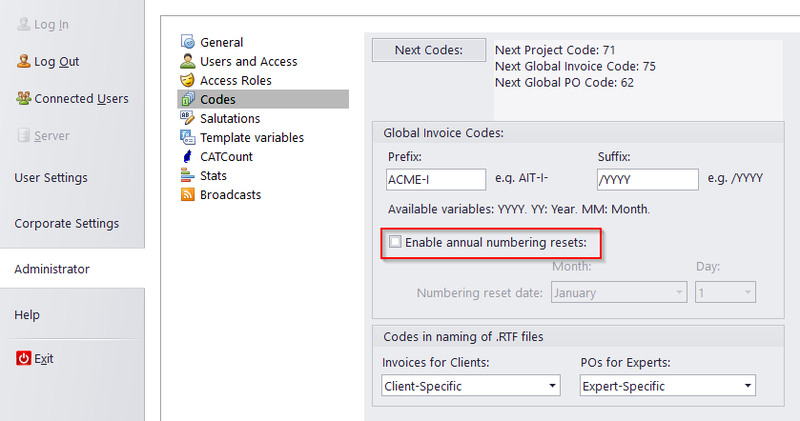 Once you have enabled the ‘Enable annual numbering resets’ function, it will make changes in your database permanently. It means that on the 1st January all numbers of your invoices will be changed. And even after reinstalling the application, you could not return back the changes that has been made in your database. 1. Restore the database from a backup file, made before you have selected the code reset option. 2. Install TO3000 with an Empty database. 3. Every year you can just adjust Global Invoice Code to a required value in Settings menu > Advanced option > Codes section > Next Codes button.